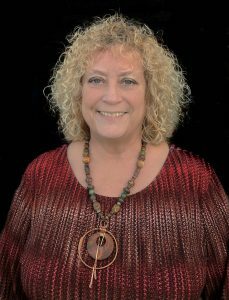 Kathy Kaberline a Colorado native who splits her time between Colorado and California has always been a professional artist incorporating may artistic modalities through out her life. One of which is her distinctive one of a kind jewelry that incorporates semi precious stones. She has always been intrigued with the uniqueness and beauty of each stone, which provides her with endless possibilities for her to work with as an artisan. Her passion is not only acquiring such amazing semi precious stones from all around the world to incorporate them into her jewelry, but to bring them into wearable works of art that showcases the energy and essence of that particular stone. She loves to open up creatively to her large statement necklaces where she incorporates a large quantities of stones that will indeed stand out with any fashionable attire and make a statement. As a professional artisan each piece is uniquely created by her and not mass produced. Making each piece a distinctive one of a kind creation. Her jewelry creations have been worn from those all around the world while the quality materials and everlasting designs can be worn through out the ages and never go out of style. My mom introduced me to semi precious stones, and was the first one to encourage me to incorporate the semi precious stones into my art. She creates jewelry and began teaching me the stones and taking me to the gem, jewelry and mineral shows. My mom is now my partner in collecting the stones that I use in my paintings. We have been fortunate to work with many collectors and vendors from all around the world sourcing my stones that I use in my work. We meet them at the large gem and mineral shows throughout the country. She also does lapidary and has provided me with a ton of wonderful stones she has collected personally through out the many years of her enjoying being a “rockhound”. We also enjoy mining and finding the stones ourselves, but I’d rather paint and need so many that I have to leave that mostly to the professional collectors. It is a wonderful partnership! I’ve been so fortunate to meet some amazing people among the gem and mineral communities. Together we collaborate with our work. 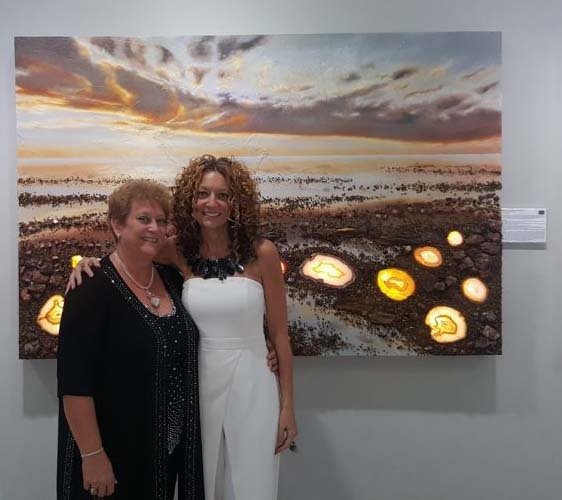 I will paint a particular painting using a specific stone, then she will create a statement necklace to coordinate with that particular painting. We have had so much fun in doing this. We both provide one another with inspiration. She also has custom made statement pieces that I wear at all my art functions so I will match my painting and the stones I’ve used in them. Further connecting not only my paintings with her jewelry, but one another. This is what makes my work so unique and special. There is so much wonderful energy behind each piece from the people and stones themselves. Then with the underlying foundation of my work, which has and continues to be HER!